After a busy November and December, I am thrilled to announce that I have released a new book today! In Strange Waters is a new short novel in the O’Ceagan Saga series. While it is in the same universe, it features one of the supporting characters from O’Ceagan’s Legacy, Dari, the shape-shifting puca or pooka. As a recent resident on Erinuua (New Ireland), a planet in the Dragon Star system, Dari is eager to explore his new home and find his place in it. For a shapeshifter stranded on a distant world, water is life itself; the main thing that makes his self-imposed exile tolerable. But Dari soon learns the waters of Erinnua are not like the seas of Earth. The sea life appears twisted and distorted. Swimming in it feels unnatural to his water horse form as he finds it disturbing and dangerous. Even the dominant underwater species may be suffering from the effects of a terrible human-caused accident. In fact, all life on the planet may be at risk if what he fears is true. Can Dari convince the human colonists of the danger and work with them to prevent the disaster threatening their world? In Strange Waters is available NOW on Amazon Kindle! It will be on a special sale price of 99-cents until Sunday at midnight Pacific time. If you enjoy my writing, please take a look at it, sample a few pages, and grab a copy if you like what you read. Before you ask, I am planning to release a paperback version on Amazon in a couple of weeks. Just finishing up the back cover now. In February, I am participating in a Sci-Fi/Fantasy giveaway on Prolific Works. From February 7th to February 26, I will be joining with other authors to bring you over 50 reading opportunities for free books or short stories. 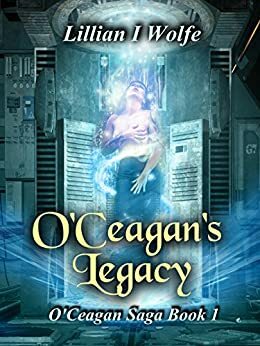 I will be offering the full version of O’Ceagan’s Legacy in this giveaway. So, look for my update at the start of this promotion. It will be a great chance to grab the book for free. I will be sending the link to the giveaway out in about two weeks. My current project is Time Walker, which I am prepping to go to an editor in late February. It’s an exciting and fun time travel/ steampunk book that I am planning to release before the Book Lover’s Convention in New Orleans in May. I will be at this convention. Are any of you going? I will also be going to the World Science Fiction Convention in Dublin, Ireland in August. If any of you are planning to go, let me know. Would love to meet up with you there. That’s the news for now. Please take a look at the new book and pick up a copy if it tickles your fancy.